Abstract: Next time there is a really inexpensive piece of hardware for sale at your local computer place, stop and think about if it's really worth it. After all, you may just get exactly what you've paid for. This is a tale about how things that look like good deals are sometimes the complete opposite... Specifically BEWARE THE $9 NIC CARD! These are the two contenders. One of these cards cost us $25, and the other only $9, both were brand new right out of the box. 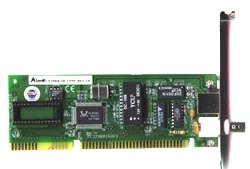 10 Base_T NIC card. ISA slot w/h ethernet and BNC connectors. Plug-and-play. Also came with a BNC T-joint (male - female, female). Instructions and driver disk. 10-100 NIC card. 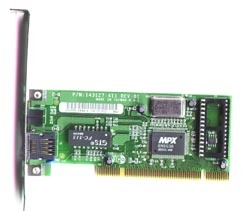 PCI slot with ethernet connector only. Plug-and play. Driver disc only. We went shopping for a few NIC cards recently and came across these two. One of these NIC cards was worth the money, the other was a complete waste of it. Why? Well, lets go over all the details first. Both cards were supposed to be plug-and-play, but both cards refused to load up the correct drivers in Win98. This wasn't too much of a problem as each came with its own disk of drivers for just about every type of system known to us. Card A came with printed instructions which was nice, but the more-important driver disk was blank. Luckily we had gotten two of each for our purposes so this wasn't much of a problem, though it could have been a real pain. Card B came with no printed instructions, but the disk worked so we didn't really care for the lack of reading. Both slipped easily into their slots naturally. It's really hard to mess up new hardware installations these days. Windows does almost everything itself the first time around, so installing these NIC cards was fairly easy. We put the cards in, turned on the computer, and when prompted slipped in the driver disk clicking on the right directory. One of the cards had its own install program so we used that instead. Okay, here where the $9 warning comes into play. One of these cards actually installed, is now humming away on the network. The other, the $9 card, is sitting in its box, and doing all it will ever do right there. Yes, We spent many tries at getting it to install, and actually work, but it never did. The drivers would 'install' but I was never able to get the thing to actually work... sigh.